RomSShell AE is a Secure Shell (SSH) toolkit that is often used in conjunction with RomCLI AE to deliver secure remote device management capabilities to many Internet of Things (IoT) applications. 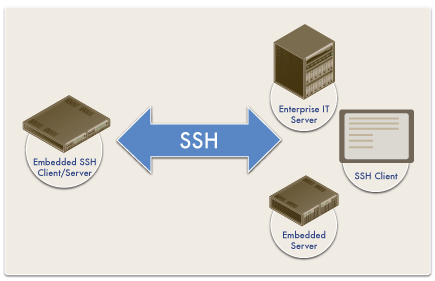 SSH provides encrypted communications between hosts over an insecure network. SSH and RomSShell AE offer a range of client authentication options other than X.509 public-key certificates which require a fully functioning public key infrastructure. SSH is also useful for port forwarding (sometimes called SSH tunneling) allowing you to arbitrarily tunnel secure TCP connections. Although traditionally found in enterprise and networking infrastructure products, SSH popularity has spread to many additional vertical markets and now includes: consumer electronics, defense, gaming devices, medical applications, and the Smart Grid. Allegro’s RomSShell AE client/server toolkit supports SSH version 2 and is pre-integrated with Allegro’s FIPS 140-2 and Suite B cryptography. RomSShell AE is also tightly integrated with RomCert, an embedded implementation of Online Certificate Status Protocol (OCSP) and Simple Certificate Enrollment Protocol (SCEP), that makes embedding security certificate management into resource sensitive embedded systems and consumer electronics fast, easy and reliable, while decreasing time to market.